For 12 years now I have been working in nightclubs. I started as a VJ and transitioned into producing promotional videos when the demand for live visuals, where I live, dramatically dropped in about 2006. I thought I would write this short guide because shooting clubs is something I am looking at moving away from and so I want to share what I have learned with people who have fresh interest in pursuing it. Don’t think it is going to be easy to make a living from nightclubs. On the whole the money is poor and you will likely have to make a couple of videos for nothing but free entry and a few beers but if you love clubbing, music and making videos then it can be real fun. You can meet and work with big name DJs and artists and if making music videos is your ultimate goal it is definitely a good place to start. Before you do anything, you want to be sure you are going to manage the clients expectations. The best way to do this is to straight up ask the promotor what they want. A savvy promotor will be constantly online checking out their local competition and what other brands are doing elsewhere in the world; chances are they will have a pretty specific idea of what they like and what they don’t like. If they can send you examples of the kind of stuff they like this will help you no end. Don’t be under any illusion that you are going to nail it first time, unless you are doing it for free! Don’t take offence when a client comes back with changes, this is just part of the process. Be sure you set out clearly the hours you will be shooting, any animations they want made, any interviews or vox to be recorded and most importantly the pay. If you don’t have a contract then make sure all of these points are arranged in advance via email. The first lens I bought specifically for working clubs needed to have a wide aperture for working in low light and needed to be very cheap. I settled on the 50mm ef f/1.8 II, the cheapest lens currently available on the EF system. Here’s a good review. You can pick one up for around £70 on ebay and with a nice bokeh and shallow depth of field it’s a bargain. Serious downside with this lens though is that it is very cheap in design as well as price, I broke my first one dropping it in a club, it just broke in half. The focus is terribly cheap which makes trying to manually pull focus tricky to say the least. 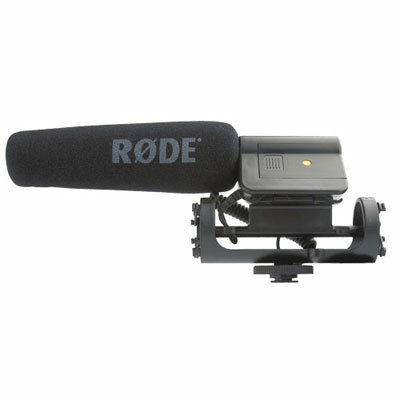 Also the focus ring is, in my opinion, too noisy for any kind of video work where you need sound. Eventually after deciding 1.8 wasn’t fast enough for what I wanted to produce I bought an old 55mm f/1.2 FD lens. I tried a couple of cheap fd to ef convertors, one with glass in which gave the lens a soft focus look, and one without glass which meant the lens couldn’t focus at certain distances. This is because adapter rings alter the distance between the cameras sensor and the lens and so some lenses can’t focus at some distances. Ones with glass help this but the glass is often poor quality and so decrease your image quality. 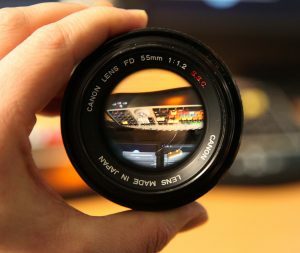 I must admit, I don’t have a great deal of experience when it comes to using lens adapters so I recommend doing a bit of research before buying a specific lens. To get around using an adapter ring I bought a lens kit from a guy on ebay called Ed Mika, Ed produces EF backs for FD lenses, you simply remove the FD mount from the back of the lens and fit the EF mount. 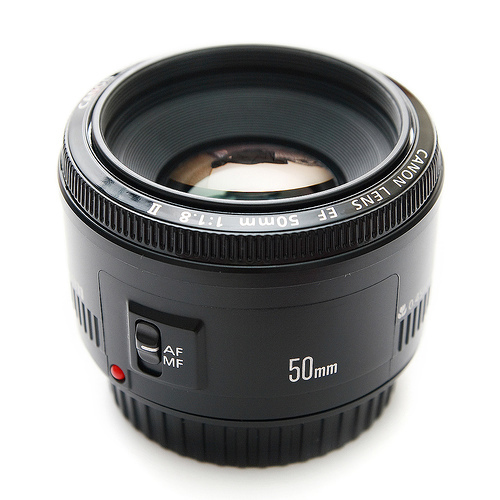 I now have an EF mounted 55mm f/1.2 lens which cost in total about £400. Granted it is manual focus and manual aperture but I love it. The only other lens I use in clubs is an old ultrasonic 20-35mm f/3.5 – 4.5 for wide, back of club shots and in crowd shots. Due to the narrow aperture, I only use this when the lights are up, when they are setting off pyros or with a top light. I try not to take valuable kit to clubs where possible and this lens serves just fine. I have never used any kind of stabilisation for nightclub videos. Generally the clubs I work in are busy, making a shoulder mount, steadicam or even a manfrotto fig rig un-usable. The only stabilisation that would work would be a monopod. I haven’t used one in a club before but I can see how they would work better than any other form of stabilisation. With the exception of the fig rig and monopod you are extremely limited in the height at which you can have the camera, a lot of the time in clubs you are going to have your camera raised above your head, either to stop it getting damaged in crowds or just to get the shots you need. Another reason why I don’t use stabilisation is that for nightclub videos you generally only need very short shots and also a bit of camera movement can be forgiven because it helps the viewer feel like they are part of the event. The only piece of kit I use which could be described as helping stabilisation is a loupe. In my opinion a loupe is essential for dslr shooting. 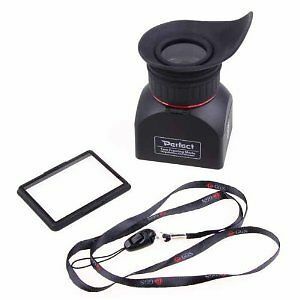 Loupes fit over the LCD screen on the back of your dslr effectively turning the screen into a viewfinder. This helps to give you accurate focus as well as to give your camera a third point of contact with your body, which greatly increases your ability to keep the camera steady. These Loupes made by GGS are around £40 on ebay and come with a plastic screen which sticks over the cameras lcd screen, with the dual purpose of protecting the screen. The loupe then clips onto the plastic screen. The loupe is hinged so it can be raised up for those elevated shots where you need the screen. Being that £40 is still not a lot of money when it comes to camera kit it will get knocked off every now and again so buy one with a safety cord. They are after all only plastic and if they fall on a hard floor the hinge could easily break. In saying that, I have only had mine fall off about 3 times. 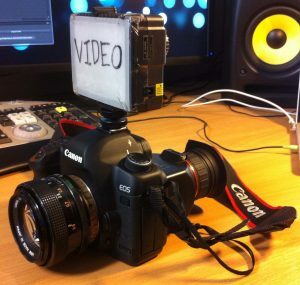 Because these stick onto the camera please research compatibility before purchasing one. I have a Cinedesign 24 led dim-able panel light I use on top of the camera for the close up crowd shots. There are loads of different cheaper models available on amazon, I use the diffuser taped on it to spread the light out a bit. The only other piece of video kit I use is a rode video mic. I don’t use this all of the time but I leave it in my bag in case the promotor wants a quick interview with an artist or vox from the punters. 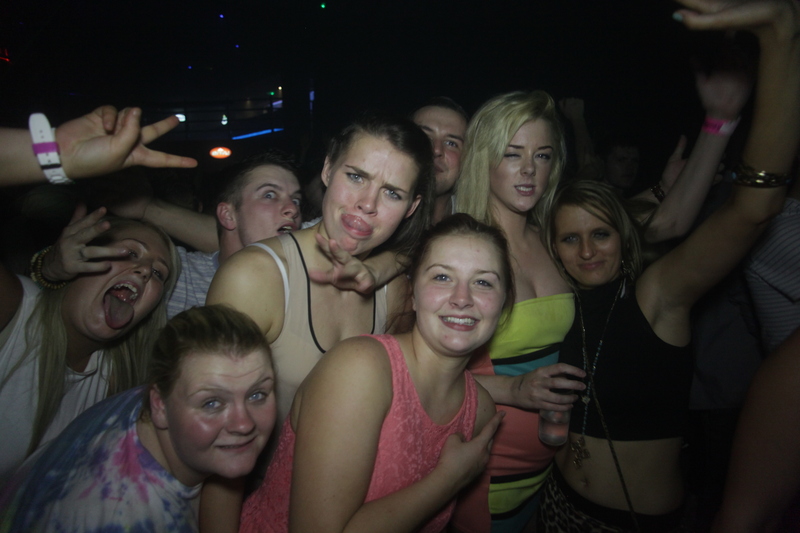 Usually in a club I have my iso at 1600, f/ stop as low as it will go and my shutter speed at 50. The booth is usually the brightest place in the club so you can often get away with lowering your iso in there. Occasionally I have to alter shutter speed down to as low as 30, this is because of lines caused by DLP projectors, there is no escaping them but stopping down your shutter speed helps. On the way into any venue say hello to the doormen, just so they know your face. it has never happened to me before, but if they see you in trouble then hopefully they will come to your aid a bit quicker if they know you are working. Also the doormen knowing your face is going to help you stand places you shouldn’t be standing and get places average joe isn’t allowed – the booth / vip etc. One of the most challenging elements of working in clubs is dealing with the public. Obviously this totally depends on what kind of club you are shooting. If you are sticking to student bars you aren’t going to have nearly the amount of problems as you would shooting a big name house DJ in a superclub. Unfortunately, a lot of people can’t seem to read after a few drinks and whatever else. A really special selection of people don’t even understand when you try and tell them you are shooting a video. Often I have been forced to take a terrible photo with a 55mm prime lens on 50 shutter speed and hope they don’t want to see it, sometimes you have to show them and they leave thinking you are a terrible photographer. The vast majority of artists I have shot have been fine about me shooting them. Sometimes you are told you have 5 minutes in the booth at the beginning of the set and very occasionally as mentioned above, you aren’t allowed to shoot them at all but most tour managers and artists aren’t stupid; they realise it’s just part of the package. I always thought it odd that they have a sea of camera phones trained on them and they are telling me to stop shooting. I’m the only one not putting the audio on youtube! Regardless of the limitations, you just have to do as you’re told if you want to be invited back by the promotor. For an average club night I will normally shoot for somewhere between 2 and 3 hours unless there are a lot of acts the promotor wants you to catch. Starting at 12 and finishing at 2-3 will catch peak time and usually the main act(s).I don’t like hanging around after 3, the club empties out and people get too drunk to be manageable. Also if you are drinking you don’t want to be in a taxi queue with £1500+ of kit. You don’t want to shoot too much anyway, on a typical night I will shoot about 150 – 200 clips, which is about 12gb of footage. Remember you want to create a rough story so get the outside of the club, the logo, the promotors’ posters for their next events and the queue, if there is one. Any other entertainment they have paid money for- angle grinders, stilt walkers, fire breathers – all of that. Shoot low – If you have a specific point of interest, like the booth, get as many bodies in the shot as possible by keeping the camera a bit lower than you would normally have it. Similarly avoid the elevated shots. Vignette / blur edges – Use a vignette in post to hide negative space, or blur edges, obviously don’t go overboard or it’ll look like the club is being viewed through a telescope. Shoot close – if you are shooting someone dancing and there is no-one around them, obviously get closer than you normally would. 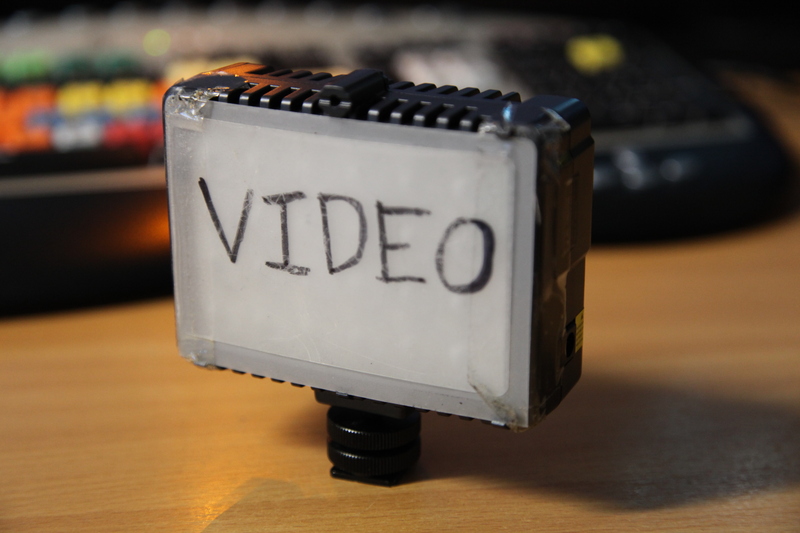 Shoot short – short clips are your friend in a dead club. The edit is a tricky thing for me to comment on without knowing what kind of event you are shooting but I mostly shoot dance music events and so my edits are mostly quick and unless there is a large interview section I try not to exceed 2.30 in duration. Other than that, I guess, just have fun with it! Make your own style and don’t rip peoples work off. Thanks for writing this. I’m just starting to learn about shooting live events in low light so I’m always looking for tips. That montage of people who think you’re taking a picture is hilarious. I have a 7D so people always think I’m just taking pictures and they tend to leave me alone. When I had a shoulder-mounted camera, it was a completely different story – every exhibitionist in the world gravitated toward me. Maybe location has something to do with it too – I live in New York. Hi Din, I’m glad you liked my post. It seems to be that as soon as I turn the light on they flock to me like moths to a flame, reminds me of a zombie flick. Thank you for writing this article. I’m new to the whole club promo scene and I just did my first gig a few weeks ago. You touched on a bunch of topics that I was unsure of which was great. However, I know you said that sometimes you might have to do gigs for free which I understand as well. But my question is, what type of guidelines do you go by when it comes to charging a client/promoter for your work? Especially one you’ve never worked with before. I don’t wanna be one of those guys that everyone says “charges too much” but I don’t want to undersell myself either. I know I do good work and my turn around time is usually pretty fast. You can see my first gig at “youtube.com/exclusiveaccess”. The video is called “Frank Reyes performs at Club Iguana for the Hennessy ‘Never Stop, Never Settle’ tour”. I’d appreciate any feedback! I’m glad the article has been of use to you. When I wrote this I was aware people would be wanting to know what to charge and I have had a few emails from people asking since too. The reason I didn’t go into that is simply because it is so dependent on the scene in your city. Not just in terms of how much clients will pay but also in terms of who else is operating in the city. When I was doing it I was only getting £300 but I am in north east England and there is a lot of competition here. Even in other cities in this country people could be charging double that so for you to try to apply that to where you live isn’t really feasible. Great article. I shoot on average 2 club videos a week and have been doing so for about a year now. Funnily enough Ive shot Paul Van Dyk as well when he was last in Australia. I usually bring a 50mm lens along with me but I find the king of club video lenses is the canon 16-35mm. Its a fast lens stopping down to 2.8. I shoot on a 6D so my shots are pretty clean at 2500 iso and it allows you to cover all the shots that you need in a club. You can zoom into 35 and get more close up shots with nice background blur but you can also get really close to people and party with them and get a good wide shot of them. I generally only use the 50mm when the club is quiet empty and for creative shots of drinks at the bar or interesting things in the venue. 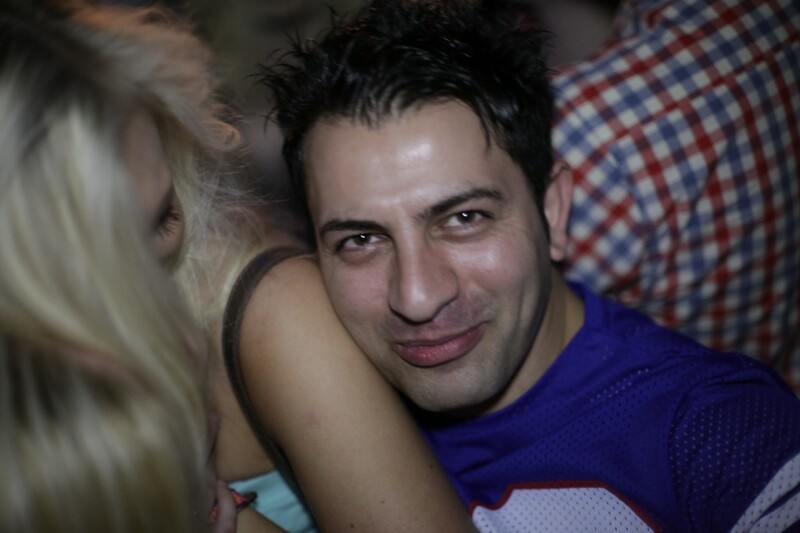 I find that its too close up if the club is busy and people always want to dance into the camera and all of a sudden their too close and you have a shot of just half their face. Hey Dan. Thanks for the tips on shooting video in a club. We host Salsa dancing events and take lots of pics and video that we post on FB and some on our web site salsa4life.com I love the idea of the sign saying “video”. So what sort of light do you use when shooting video? Thanks again for the article.